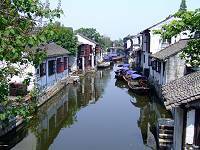 It took us about one hour to drive from Suzhou to the water city of Zhouzhuang. We arrived late in the afternoon & checked in at the 3* Yunhai Holiday Villa hotel. The hotel has a very good location by the lake and is near the town centre and old town. This is the best hotel in this rural water city. The hotel even has swimming pool & tennis court but the breakfast was catering mainly for Chinese food. In the evening we wandered in the old part of the town looking for dinner at the one of the many restaurants lining both sides of the canal. We did not go beyond the first restaurant before we were grabbed & stopped at the first restaurant. All the restaurants have their tables by the edge of the canal under the trees and & red lanterns. During our dinner there were boats passing up & down the dark canal providing the evening entertainment. Some boats had local people dressed up in traditional Chinese costumes, others play musical instruments or display colourful Chinese lanterns etc. It was a lovely atmosphere. 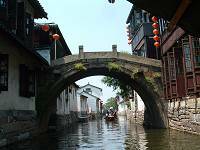 Next morning we entered the gate to the old city of Zhouzhuang. 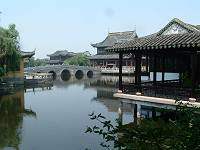 This town offers a step back in time with canals, stone bridges, cobbled streets & narrow lanes with houses dating back to the Yuan, Ming & Qing dynasties. Despite the crowds & many souvenir shops it is quite magical to walk through this wonderful canal town. A canal cruise along the canal is also very pleasant with view of some of the houses backing to the water. Many local people are living in this famous ancient town. There is a local barbershop, temples & women washing their clothing in the canal away from the tourist souvenir shops. 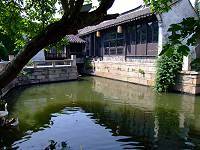 There are many old houses & temples in the old town but the most famous are the Hall of Zhang's Residence & Hall of Shen’s Residence. 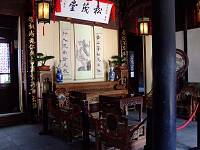 First we visited the Hall of Zhang's Residence. The most beautiful aspect of this residence is a small waterway running through the back of the house that allowed access to the house by boat. the courtyard has steps down to the pond that allows access out to the canal along a small waterway from the house. Some of the rooms of the house have windows looking over the pond & waterway. It would have been quite tranquil in the old days for the household to sit by the window to look at the goldfish & ducks swimming below in the pond. It is still a beautiful picture hundreds of years later. Another old house in Zhouxhiang is Shen’s residence. This has many separate buildings and over 100 rooms with seven private courtyards. Looking at the rooms you can image how the family lived all those years ago. We also visited the South Lake Garden. This is a very pleasant park consisting of lakes, bridge, temples & pagodas. The whole area is peaceful & quiet by the lake & away from the centre of town. It was a very pleasant visit. That night we went back to another restaurant by the canal for our dinner. Next morning we left Zhouzhuang & drove to Shanghai.